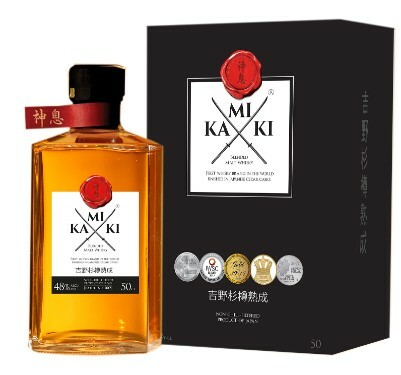 Kamiki is the kind of whisky that typically sets off alarm bells in my head. It's a Japanese whisky... blended with other whiskies from around the world. Which isn't unheard of in Japan, but we have no inkling about where any of the global juice comes from. How old is the final blend? "At least three years" is all we know. But it's finished in Japanese cedar casks!... for an undisclosed length of time. Do they distill any of their own juice? Not from what I can tell. Do we know who their master blender is? Not a clue on the website. The folks at Kamiki aren't exactly forthcoming with the details, and being a skeptical sort, it makes me wonder what they're not telling us. But the proof is in the tasting, and I got to try Kamiki's new expression, Kamiki Intense (48% ABV, $150) and judge it for myself. Kamiki Intense is different from standard Kamiki (which I've not yet tasted) in that it's finished in cedar, known as Yoshino Sugi, for at least twice as long, and up to three times as long depending on whether the finishing is done in summer or winter. Twice as long or three times as long as what? We still don't know. Regardless, this is a terrific whisky. The nose is mainly dry apple cider and honey, with an unmistakable whiff of cedar mixed in. On the palate it's pretty similar, with a sweeter honeyed apple flavor followed by dry, spicy cedar midpalate. Each sip evokes Proustian memories of the cedar closet my mom had in my childhood home — and without the mothball scent, thank goodness. The finish is medium-length, woody with undertones of caramel, and tasty enough for me to wish it would linger just a bit longer. At a time when whisky makers are experimenting with unusual wood finishes, I can get behind a cedar-finished whisky, and this one in particular. It's not quite up there with the Yamazaki Mizunara Cask or Westland's Garryana oak-finished masterpiece, but it's a worthy addition to the canon. I hope we'll soon find out more of the story behind the brand, but for now I'm happy just drinking the whisky, which is presently available exclusively through Dekanta.